For those of us languishing under bleak northern-winter skies, these delightful, moving and uplifting memoirs of a year’s sojourn in Turkey offer a comforting reminder that the Aegean climate can be challenging too, both in summer and winter, with extremes that we in these temperate isles rarely experience, and then never for long. The Anatolia Jack Scott conjures up In Perking the Pansies (a punning horticultural reference) is no Arcadia. And just as he paints the meteorological climate warts and all, so he does the social climate, both of the ex-pat British community and the native Turks, especially in their response to an openly gay male couple living in their midst. Jack and Liam, a forty-something gay couple in a civil partnership, decided to throw over the metropolitan rat-race, take early retirement, sell their homes and move somewhere warmer and cheaper. By 2009 the economic global collapse is well advanced and European countries such as Spain and Greece no longer appear affordable or even particularly stable. By working their way round the map of the Mediterranean, Jack and Liam eventually settle on Turkey as being both affordable and, for a Muslim country at least, reasonably tolerant. Thus the momentous move is undertaken and Jack and Liam find themselves renting a new-build villa in a development on a steep northern flank of Mount Tepe known as Tepe Heights, which, with its strange assortment of human and animal residents, appears distinctly Wuthering in character. Scott peppers his memoir with such tellingly satirical terms, and thoughtfully provides an Expat Glossary at the end which, along with emigreys, includes examples such as semigreys, VOMITs (Victims of Turkish Men), vetpats, hedonistas and ignorati. His use of such terms provides a camp commentary that makes reading the book such a joy. The book includes a list of colourful characters, British and Turkish, too many and various to list here, but almost Dickensian in their eccentricity, humour, melancholy, self-delusion, kindness and casual cruelty. There is heartlessness and tragedy here but also a generosity of spirit and a positivity, along with a dogged determination to see the best in humanity, which is almost Panglossian. 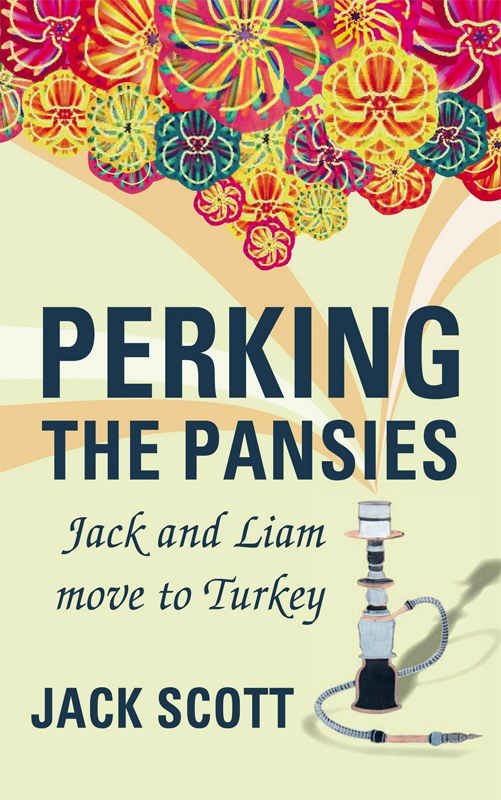 Perking the Pansies is truly a Turkish Delight and I for one can’t wait for the sequel to find out how Jack and Liam, and their coterie of friends and acquaintances, get on in their second year in Bodrum. To visit Jack Scott’s blog click here.